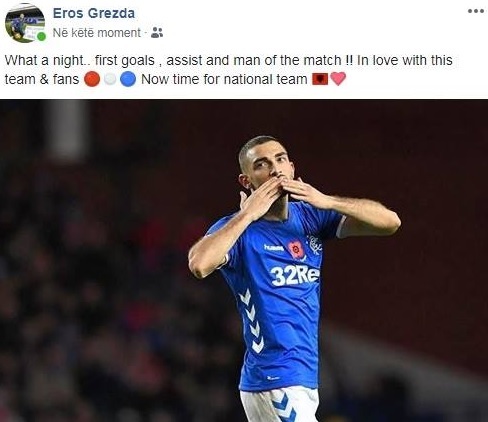 Albanians can keep the given word according to legents, and this is best proved in reality by the player of the Albanian national team, Eros Grezda. Two days ago he stated that he would give the maximum if he would be activated with the Scottish team by the coach Steven Gerard. And in fact this happened today, after Gerard activated him he played a great match with Rangers, scoring two goals within seven minutes against the team of Motherwell. In the deep 7-1 victory, the Albanian was not the only two-goal protagonist, but assisted in the fourth goal for the team. The game played, his technique and grinds and goals made Grezda as the man of the match. The Albanian player has shown a strong and martial character in this game, giving joy to Rangers fans, but also to Albanians.